Place these cool new Miniature Greenhouse Garden Row Tunnels all along a row of garden plants to help protect them from harsh cold and windy weather and hungry animals, plus warm the soil for earlier planting in the Spring and extended growing well into the Fall months. 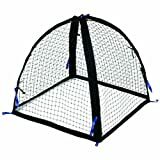 They can easily be lined up to form longer rows and feature adjustable vents at each end to help prevent overheating, have a handle on top for easy plant access, and include four anchoring stakes to keep them securely in place. A great space-saving alternative to having a massive greenhouse, which would, of course, be nice to have as well. 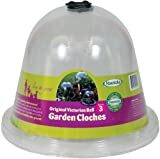 BestNest Set of Six Panacea Rustic Wire Garden Cloches, 20"